Mark Horne left, and Caden Wilson. 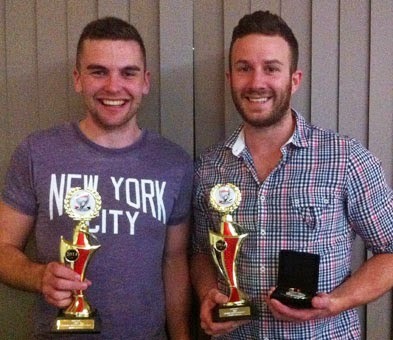 THERE were three very close results at the New Norfolk District Football Club's annual best and fairest count and trophy presentation last Saturday night. All three divisions came down to the last couple rounds before the winners were decided. Seniors: William Leitch Medallist Caden Wilson took home the Les Hepper Medal after polling 39 votes, winning by four votes from runner-up Mark Horne. 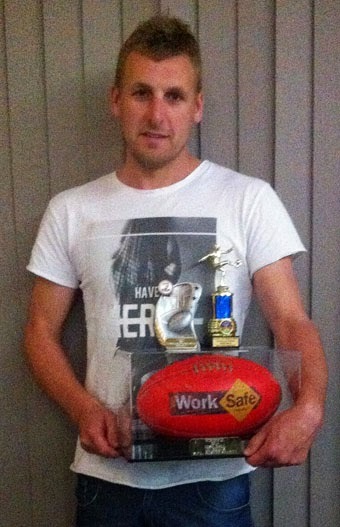 Reserves: Full forward Kris Cashion won the Roydon Howard medal. The hundred-plus goal kicker polled 33 votes to win two votes clear of coach Josh Kelly who won the award in 2012. Colts: It couldn't have been any closer in the Under 18s where a three-way tie was the result. Brandon King, Ryan Wakefield and Jake Foster all finished on 18 votes while runner-up Joshua Whitford-Marriott was runner-up on 16 votes. It was a fantastic season for the Eagles and the three close medal counts just shows the amount of talent amongst all three teams. Well done to all, and in particular to Ryan Wakefield for winning his third straight best and fairest award, starting with the Under 15s title in 2012 and the Under 18s award in 2013. Congratulations to Josh Hall (112 goals) and Kris Cashion (110) who received special awards for the goal-kicking feats as did Jye County who kicked a club record of 20 goals in an Under 18s game against Cygnet. Another player to accept a milestone award was club stalwart Roger Belcher who now holds the record for the most senior games played. Belcher surpassed former player Chris Sproule's 264 games earlier in the season and now has the grand total of 275 games and I hear is going around again next season. While on the subject of games played, well done to Josh Kelly who broke the most games played in the reserves. This record was previously held by club stalwart Dean King with 180 games. This was a fitting result as King was bench coach to Kelly this season. During the speeches on Saturday night, senior coach Jon Murray told all that he was stepping down as coach as he and wife Cara are starting a family. This is a big loss, but Murray said he will still be involved in some capacity with the club for 2015. Coaching the reserves to the 2012 premiership and then coaching back-to back-flags with the seniors, "Muzza" has served the club well. A superb effort. I have heard speculation that Caden Wilson may be taking over the senior rains for next season. Another leader stepping down is reserves coach Josh Kelly due to work commitments. "Ned" has also given great service, not least coaching the reserves to this season's premiership. In his career he has played 243 club games (54 seniors and 189 reserves). Well done Ned, you will be missed both on and off the field. Perhaps Dean King could be a likely replacement? In the Under 18s, I believe Ben Lovell will be joining Josh Clifford as joint coach for next season. With as many as five spots up for grabs on the NNDFC board at the AGM, there will plenty of changes at the club for 2015. After the trophy presentations, there was live music and also an unofficial comedian in Larry "Lazza" Menzie who had the crowd in fits of laughter. A good night to finish off a fantastic season.